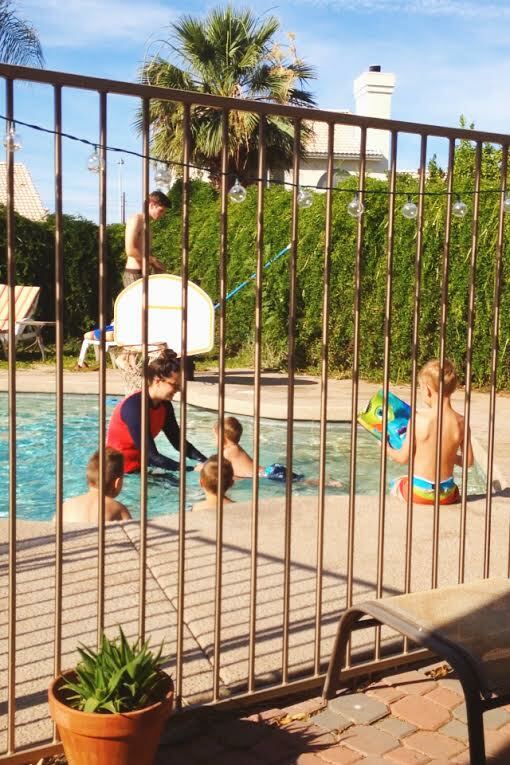 Last week the boys started taking swimming lessons from my niece, Jamie. Last year, it was just William but, this summer, I decided to start Fritz as well. I was hoping that having them in a class together would make it easier on William (who is scared of the water and very strong-willed about not getting in). Fritz is very interested in the water but also very uninterested in doing anything without me so the first few days were pretty rough. Things at the lessons are getting better though and they have another week, so I'm hoping to see some improvement. I just want them to be proficient enough to swim to the side of the pool. On the off days, I've been taking them to my sister, Alice's, house to keep practicing. Fritz has become a completely confident, huge fan of the water. He just jumps right in with the hugest grin on his face and comes out of the water in giggles. He probably "swam" to me and back to the steps over and over again about 25 times on Friday and then on Saturday afternoon, we went back and he did even more swimming with Dad there. 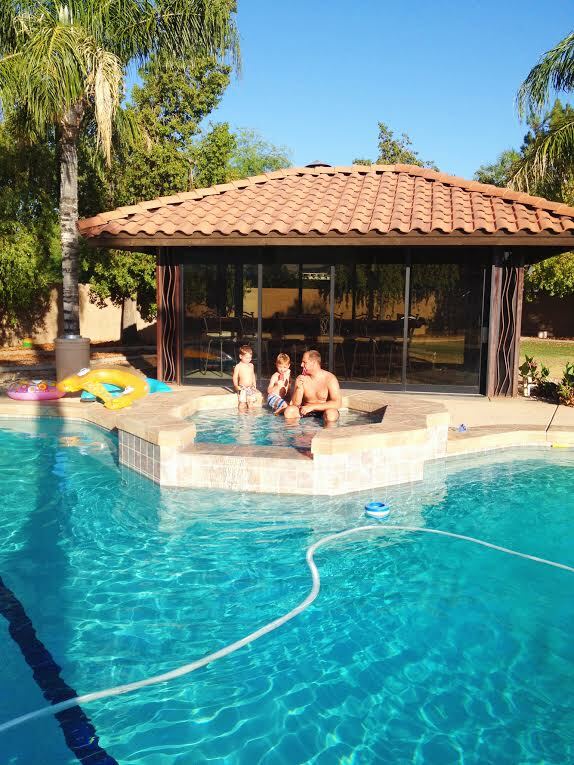 He was thrilled to have an audience and David was doing all kinds of fun tricks (like dolphin splashes and cannonballs off the diving board). Fritz was enamored and it's clear to see that he's the fish in our family. After about an hour of refusing to get in the water, William even ventured in after I had a big talk with him about how we get brave by doing things that scare us. It's not like I want him to be a daredevil (please no!) but I know that I missed out on a lot of opportunities to learn how to do things as a child, because I was scared and because I felt too embarrassed to try. William is a lot like me in that way and I have to remind myself that when I was his age, I just wanted compassion and understanding for my feelings. There are some times when I want to roll my eyes or just force him to try things, but then I ask myself, "What would I have wanted when I was in this situation at his age?" It's been helpful for me to remember that considering feelings and showing an "increase of love" is the way I want to be a parent. I'm grateful to have these experiences as a mother to help improve myself as a person! Mmmm, I miss the palm trees... Looks so peaceful out there!